LANDER essentials® Lubricating Skin Lotion effectively restores and rejuvenates skin, as its unique formula absorbs into the skin to soothe as it softens and protects. Enriched with vitamins and formulated by dermatologists, LANDER® essentials Lubricating Skin Lotion products nourish skin, keeping it healthy and soft. LANDER® essentials Lubricating Skin Lotion comes in a 20oz. bottle and is available in fresh Cucumber Aloe, hydrating Cocoa Butter, Original and Advanced Formula for particularly dry, chapped skin. Skin-replenishing LANDER® Advanced Skin Care Face Cream is enriched with natural moisturizers to promote healthy restoration for a variety of skin types. It comes in an 8 oz. size and leaves your skin felling healthy and soft with out feeling greasy. Available in Aloe Vera for chapped, dry skin, Cocoa Butter to nourish and restore the skin’s surface, Vitamin A Enriched to stimulate cell growth and improve skin’s appearance as well as Original for overall skin renewal. Frequent handwashing and harsh household cleaners can leave hands feeling dry and rough. 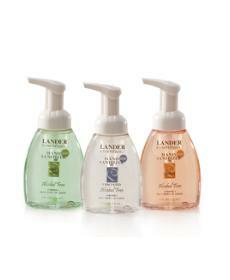 Restore your skin’s natural moisture with LANDER essentials® Ultra Rich Hand Lotion. LANDER essentials® Ultra Rich Hand Lotion is specially formulated to moisturize and replenish skin, leaving it soft and supple without drying up your bank account. Try Cucumber Melon, Fresh Lavender, Orange Ginger, Coconut or Vanilla Créme Caramel. Available in a 12 oz. pump. Rinse away dirt and grime without leaving hands dry and coarse. 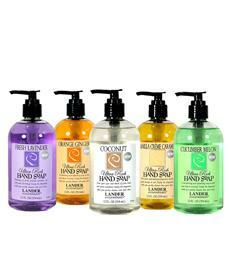 Try LANDER essentials® Ultra Rich Hand Soaps. Specially formulated to lock in your skin’s natural moisturizers while cleansing away germs and bacteria. 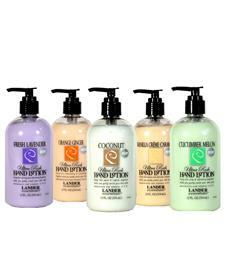 LANDER® essentials Ultra Rich Hand Soaps will leave your skin fresh and luxuriously smooth. Available in 12oz. pumps of five sensuous scents, including Vanilla Créme Caramel, Fresh Lavender, Orange Ginger, Coconut and Cucumber Melon. 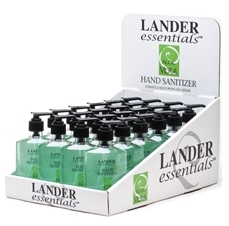 Cleanse hands of 99.9% of illness-causing germs and bacteria in only a few seconds with LANDER essentials™ alcohol-free hand sanitizer in an 8 oz. bottle with foaming pump. Available in three scents including Orange Blossom, Apple Berry and Unscented. LANDER® Kids Alcohol-Free Foaming Hand Sanitizer is also available and comes in three great scents that kids will love including Candy Apple, Citrus Blast and Unscented. Additionally, LANDER essentials™ original hand sanitizer formula is available in either Aloe Vera or unscented varieties in an 8 oz. size with a hand pump.